Michael van der Mark started on Sunday in Race 2 at Round 5 of the 2018 FIM Motul Superbike World Championship at Imola from the front row and was battling in the podium group when he made a small mistake and crashed out of the race on lap 9, recording his first DNF of 2018. Michael van der Mark started Race 2 from the front row after he had pulled off an almost identical feat to Lowes in Race 1, crossing the line in sixth after lining up 12th on the grid. When Race 2 started, the 25-year-old Dutch rider got a good initial drive off the line but was having some issues in trying to get his Pata Yamaha R1 stopped for the tight chicanes due to a lack of front-end grip. Riding around this problem, he managed to stick with the group battling for the podium in the opening laps and then, as is his trademark, his pace started to improve as the laps ticked off. He recorded his fastest time on lap seven and by that stage was in fifth place and closing down Marco Melandri ahead of him. Unfortunately, while chasing Melandri on lap 9 into Turn 18, he just could not get his R1 stopped in time and, despite his best efforts to avoid a crash, ended up making contact with Melandri and both riders went down, luckily escaping unhurt. Immediately, he made his way over to Melandri in the gravel trap to apologise and then went straight to the Italian’s garage to apologise to his team, admitting he was at fault. Disappointed to have missed out on the chance to fight for the podium and some vital championship points, van der Mark still leaves Imola happy with the progress made on his Pata Yamaha R1 and determined to bounce back at Donington Park. His first DNF of the season sees him drop to sixth in the overall standings with 113 points, just 11 points behind Xavi Forés in fifth. 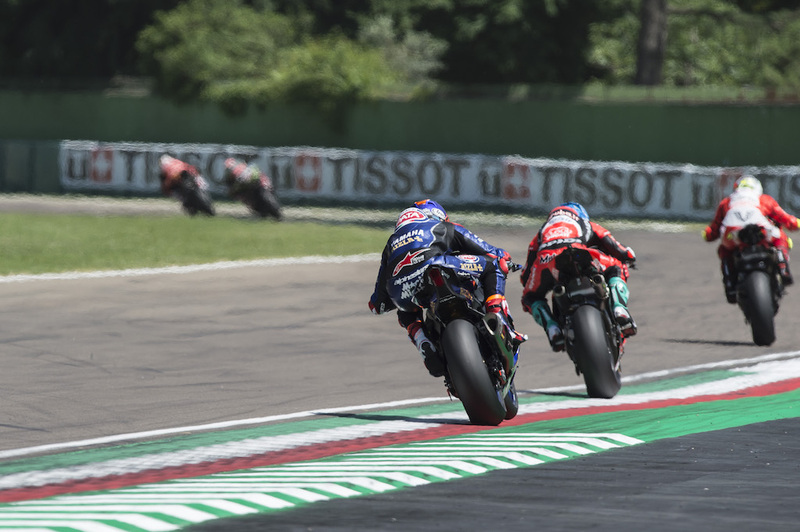 After a weekend of mixed results but buoyed by the improvement shown at, traditionally, one of the toughest tracks for the R1, the Pata Yamaha Official WorldSBK Team head to their home round at Donington Park in the UK on the 25th-27th May full of confidence.